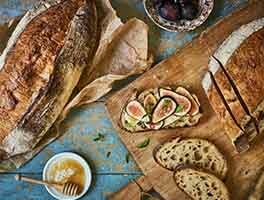 This sourdough loaf is enhanced with whole grains and a generous topping of seeds. *Sourdough starter can vary quite a bit in consistency. Use enough water to make a soft dough. In a large mixing bowl, or the bucket of a bread machine, combine the fed sourdough starter and 1 cup of the water, mixing until smooth. Add the remaining dough ingredients, and mix and knead — by hand, mixer, bread machine, or food processor — until you've made a soft dough, adding additional water as needed. Note: If you're using a bread machine, program for the manual or dough cycle. Check the dough's consistency after 7 to 10 minutes of kneading; it should be smooth and elastic. Adjust as necessary with additional flour or water. Cover the dough in the bowl, and let it rise until it's almost doubled, about 1 to 1 1/2 hours. Turn the dough out onto a lightly greased work surface, and gently fold it over a few times to deflate it. Shape it into a large round. Cover the loaf with lightly greased plastic wrap, and let it rise until it's very puffy, about 1 to 1 1/2 hours. Towards the end of the rising time, preheat the oven to 425°F. Just before baking, brush with the beaten egg white. Sprinkle with seeds. Use a lame or a very sharp knife to make several slashes across the top of the loaf, asterisk-fashion. Bake the bread for 20 minutes, then reduce the oven temperature to 350°F and continue to bake for an additional 15 to 20 minutes, until the loaf is golden brown and a digital thermometer inserted into the center registers 190°F. Remove the bread from the oven, and cool it on a rack. 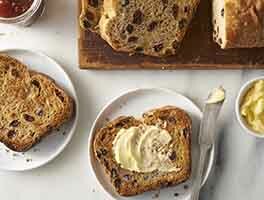 Store bread at room temperature, well wrapped, for several days; freeze for longer storage. 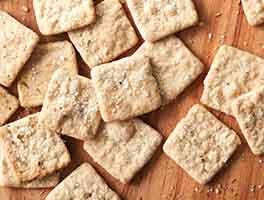 Need some sourdough starter to get started? 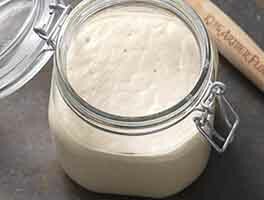 See our step-by-step directions for creating your own sourdough starter from scratch. Or, if you're looking for a head start, check out our classic fresh sourdough starter, a simpler path to fresh, ready-to-use sourdough starter. 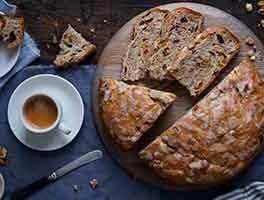 This recipe is similar to the KAF Sourdough Boule, which I've also made. Both are great breads even though they may not be what some bakers consider an authentic sourdough. The crumb is moist, tender, and while not as open as a true sourdough, it's not dense and tight either. I didn't have the Harvest Grains Blend and subbed a mix of pumpkin, sunflower and flax seeds, as well as bulgur and amaranth. The seed mix measured 2/3 cup. My starter was unfed, but bubbly at room temperature. I added 2 rounded tablespoons of vital wheat gluten, but that was the only change I made to the recipe. I measured out 1 1/2 cups water and used all but a tablespoon of it to form a dough that was soft and tacky, but not sticky. The first rise was 2 hours and the dough had doubled. I proofed the dough for the second rise in a dutch oven for just over an hour, and baked it in a preheated oven without preheating the dutch oven first. The bread took longer to bake than the published time. It baked for 20 minutes at 425 degrees with the lid on, and 40 minutes at 350 with the lid off. The crust wasn't as dark as the loaf pictured with the recipe, but the bread was done, with an internal temperature of 205 degrees. Even though the crust isn't dark, it's thin and crisp. I didn't do the egg white wash because I find that it sometimes softens the crust, and I prefer a crispy crust. Wow, great tasting, 1st time using KAF Artisan Bread Topping, will use that product again. Also used KAF Sourdough Starter I would recommend this product also. As far as the Bread goes, I did substitute the 26g pumpernickel flour, 74g Harvest Grains Blend with 100G Spelt Flour. On the second rise I used a Brotform Proofing Basket. Guten Appetit, an all Die Hobby Baeker. One Review mentioned Health issues because of the Instant Yeast! How can you turn this into full use of the sourdough starter? Is it as easy as using an additional 100G of starter, and Increasing the rise times? As in the Extra Tangy Sourdough Bread? This makes fantastic (dare I say perfect?) bread. I mixed it in my bread machine, and followed the recipe exactly except that I didn't have the Artisan Bread Topping so I just used more of the Harvest Grains blend for the topping. It will certainly become a standard in our kitchen. Mine didn't get quite as dark as the recipe photo, but it was clearly done. Fabulous nutty flavor. Fantastic bread. This has become my go-to sourdough bread recipe. It comes together quickly and easily and makes a beautiful loaf. It rises rather fast for a sourdough. The first time I made it I didn't watch it closely enough at the beginning and it got away from me. We had a very light loaf. Thanks KAF! We have a winner! Made this tonight with the starter-starter to be tossed or given to a friend. I made dinner rolls. Supplemented the 3 1/2 cups AP flour with 1/3 cup pumpernickel and 1/3 cup rye then added a couple tablespoons dill pickle juice. 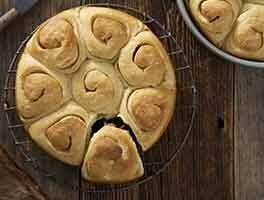 The recipe made 8 good sized rolls and were just as silky inside as they could be. Delicious. Wow! Wonderful recipe! I baked it in my brand new bread baking bowl, topped it with sesame and poppy seeds. It was picture perfect when it came out of the oven, and tasted fabulous with only a little butter on top. This was my first attempt at a sourdough bread, using my very first sourdough starter, made with lots of help from the sourdough starter blog. Complete success! Thanks!